Updated November 4, 2016 – If you’re considering an In-Canal hearing aid continue reading about the AMP Hearing Aid. It seems that the hearing impaired have always been looking for a hearing aid that is elusive as purple unicorns. Everybody wants to find that super adjustable hearing aid that is small does something that allows them to hear better than normal people and doesn’t cost very much. I regret to inform everyone; such a hearing aid does not exist. Yes, there are small hearing aids. There are even hearing aids that claim to do everything in supra-human terms. Some of these hearing aids are inexpensive. You just can’t get all those things in one package. Starkey and Starkey AMP may have come close, with its’ new AMP hearing aid. You can get a reasonably adjustable hearing aid in a small package for a very attractive price. The AMP hearing aid is not without its’ issues. It is not incredibly powerful; it will not fit losses beyond a mild-moderate level. AMP Hearing Aid has some adjustability, but not anything approaching the degree of adjustability in some of Starkey AMP hearing aid more advanced models. It has basic level features, including a decent feedback manager and a pretty good background noise canceling system. The Starkey AMP is a “modular” hearing instrument, meaning that sleeves are used to adapt the unit to each. The price, while quite attractive, is nowhere near the pennies that some folks would like to pay for a hearing aid. At $1500 a set, the unit is a value for the right patient. That being said, the patient should remember that this is NOT a product designed to answer everyone’s needs and wants in an AMP hearing aid. I have been quite successful in fitting these units as “reading glasses for the ears.” When I have approached the patient from this standpoint, we have managed to provide a favorable result. Starkey Hearing Technologies, themselves, bills the product as “The AMP Hearing Aid for people who are not ready for a hearing aid.” This product is not designed for daily wear, nor is it designed for those with a severe loss. It is also not designed to work in extreme noise conditions. If you need a little “boost” in that sales meeting or classroom; this could well be a product for you. If you wish a discrete hearing aid that has a lower price point and has reasonable expectations of the product; a StarkeyAMP could be the product for you. Invisible in the canal AMP hearing aid are available from several manufacturers. Starkey AMP hearing aid clearly have the lead horse in this race, but there are other products that some customers find attractive. Starkey Labs has specialized in small and innovative hearing aids for decades, and an objective reviewer would have to grant their leading position. While Starkey AMP has an extensive line of models, most of their products have industry leading noise and feedback control. Some professionals might suggest other products for economic reasons (theirs and the patients), but it is hard to beat the entire line that Starkey has to offer. These features do not come cheap and are not without their shortcomings. Keep an open mind and work on your rehabilitation, and do not expect a purple unicorn. As always, the patient should use care when selecting their hearing professional. The majority of the patient’s’ success with ANY hearing aid lies more with the professional than with the features in the AMP hearing aid. If you have the proper professional and the appropriate expectations, you will be happy with your hearing aid fitting. If you purchase a Starkey AMP hearing aid based on price or a set of features on a piece of paper, you may be in for a disappointment. Price or features can not measure professionalism; the professional knows what they are doing, or they do not. Also, keep in mind that a hearing aid fitting is a process, not an event. Good results take time and patience. This isn’t the only model we have, see the other Starkey Hearing Aids. i want to buy it? how can make it possible? please help me..i have hearing aid.. i’m from Srilanka. Thanks for your thoughtful review about the little “scmp amp” I was intrigued by full-page ad in today’s sfchronicle …and decided to check your website! where you call a spade a spade! Yes, it is a process and not an event to get an aid! thanks for your support for persons with hearing loss! Thanks! I hope you found it useful! I have had amps for 60 days. I am on my 3rd set. I put them in set them for 3 volume. Within an hour or so they revert back to default setting 2. The right one is at three right now and it is echoing. I don’t know what to do. You should speak with your professional. It sounds like you might be asking the Amps to do more than they were designed to do. 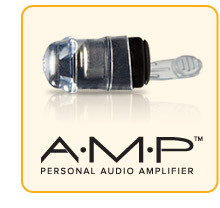 The Amp is designed for a mild/moderate loss and then (in our opinion) only for occasional use. The volume is controlled by a magnetic impulse; if you are near sources of magnetic energy (hardwired telephones, CRT’s, big speakers or headphones etc) these could all change the volume on the units. The echo most likely is caused by the volume being set too high for the units design. You may be better served with an S series product that is custom fitted. I have an offer of a free “hearing health consultation” at a nearby audiology facility — good for three days only. They include an “introductory offer” of the AMP digital hearing aid for $750 each — good only for the same three days. Given that you cite $1500 a pair as the standard rate, what do you think of this offer? i have problems from the beginning i only got one for my high tone loss left ear,i really like the size and the fit, but it keep draining the battery after 4 days send it to fix once but is doing it again,i do no want to do it because now they suggest cic model for replacement but don’t like the size? what should i do? Does any body else have this problem with the AMP? The AMP is a very specialized product that does not fit comfortably into the commonly thought of “pigeon holes” when discussing more traditional hearing aids. There was a very good review done on this site several months ago regarding the AMP hearing aid. I will not attempt to cover the same ground with this answer. The AMP has very limited frequency shaping capabilities, and therefore may not be the best choice for a steep high frequency loss. It is designed, much as the national ads for the product state, for persons who are not sure they need or will use a hearing aid full time. I tend to think of the AMP (and several products of similar function from other manufacturers, as “reading glasses” for the ears. Much like one might go to the corner drug store to purchase some inexpensive glasses for occasional use. As far as battery consumption; the use life of any battery is determined by several factors. The quality of the battery and the storage conditions of the battery (before and after sale) are prime factors in battery life. Often cheap batteries are not a bargain. The size “10” battery used in the AMP is doing well to provide 100 hours of use, even if all of the factors are going in your favor. The AMP in particular has a unique design feature that requires the battery to be completely removed for the aid when not in use. That requires the fitting sleeve to be removed and the battery slipped out of the unit. Failing to do that, will cause the battery to drain, even when not in your ear. Three 24 hour days of the battery being in the hearing aid will deplete the battery, even if you have not had it in your ear. Be very careful to remove that battery and store it separate from the unit when not in use. Be aware that finger oils (especially hand lotion) will increase the resistance in the battery connection and cause the battery to drain faster. Always handle the battery with clean hands and preferably with a facial tissue to avoid excess oils on the battery. Most hearing aids are functioning on less that a one thousands of an ampere. A small amount of debris will increase the resistance a great deal. The AMP is a very good product from what it is designed to do. It does not function well outside of those limited perimeters. For someone with anything more than the mildest of high frequency losses, RIC (Receiver In The Canal) and CIC (Completely In The Canal) units would probably be a better choice. RIC hearing aids from some manufacturers have made huge advances in the past year or so. Some of the most powerful hearing aids on the market are RIC hearing aids and have features like feedback elimination and clear quality sound that needs to be heard to be believed. There is a wide feature gulf between the offerings of one companies and the offerings of another. There is often a significant gap in function (read: quality of sound and feedback elimination or reduction) within the same companies offerings, from mainstream models to more modest units. Most hearing aids “look” similar, but that by no means should be taken for proof positive that they are the “same”. Sugar and salt resemble each other, but they are not the same. A great description. I have severe hearing loss in one ear and profound in the other. I was certain that these would not work for me and sceptical of the sales pitches (Livingston). Fortunately I am a veteran so I have access to a professional audiologist and hearing aids designed for my hearing loss. Sure the hearing aids selected are expensive (over $5000 for the pair) but they are very comfortable all day, can be programmed for a specific hearing profile as well as four stored user switchable programs for specific environments, and they provide excellent results. They are adaptable to work as the earpiece for smart cell phones and other specialty speech transmit environments (such as transmitted church services). If someone has a serious hearing loss, your best bet is find a good professional (not a sales representative) and follow their advice. I think if you come on 50th day they will still be 750 each. I would not trust them. My audiologist has suggested the AMP for me, a first time hearing aid user with mild/moderate low-frequency hearing loss in both ears. Do you think the AMP is a good choice for me ? I like the cost and the invisibility. I recently purchased the AMP hearing aid device for my moderate hearing loss, unfortunately after wearing it for about 3 hours, I had to quickly return it back to the location it was purchased. The hearing aid device worked nicely, but began to cause me to have severe inner ear pain. Apparently people with TMJ are not appropriate candidates for in the ear hearing aid devices. This little device caused me to have so much inner ear pain that even smiling made me frown due to the pain. The distributor told me that if I had told him about my TMJ diagnosis, he wouldn’t have sold me the device and would have worked me that people with TMJ cannot wear hearing aid devices that go inside the ear canal. However I was able to switch it to a more descreat hearing aid device that is not so visible but does sit behind the ear. So word of warning, if you suffer from TMJ and also have hearing loss, please do not purchase a hearing aid device that goes inside the ear canal…you will definitely regret it. I hate my amp. Every time I chew or move my jaws it emits a loud whistle which is very irritating. This is a terrible product. I do not recommend getting it.